What is a governing Board? Established by the MELS Education Act, our governing board meets monthly to discuss issues related to four areas of interest to our school. They include: general items, educational services, community services, and physical and financial resources. In the end, we make decisions that are deemed to be in the best interest of our students. 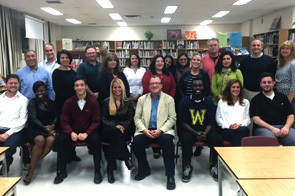 The board is composed of students, parents, teachers, administrators, and community representatives. Our meetings are open for parents to attend. Throughout the year we will post the issues we are working on in our meetings. Meetings are held in the LHA Senior Campus Library at 7:00 p.m. Parents are welcome to attend, question period is at the beginning of the meeting. October 24, 2018 7:00 p.m.
November 27, 2018 7:00 p.m.
January 23, 2019 7:00 p.m.
March 19, 2019 7:00 p.m.
April 23, 2019 7:00 p.m.
June 4, 2019 7:00 p.m.